I'd been working on a story for FoodDay all day and hadn't looked up from my keyboard for several hours. I saw what time it was and realized that Dave would be home from work in just a few minutes. I had no idea what we were having for dinner, but remembered seeing a recipe on my brother's blog that he said took as long to make as it took to cook the rice that went with it. Perfect! Heat peanut oil in heavy large skillet over medium-high heat. Add sliced onion; stir-fry until soft and beginning to brown, about 4 minutes. Reduce heat to medium. Add green onions and curry paste; stir until fragrant, about 1 minute. Add coconut milk, chicken broth, fish sauce, and sugar; bring to boil. Add tomatoes and boil 2 minutes. 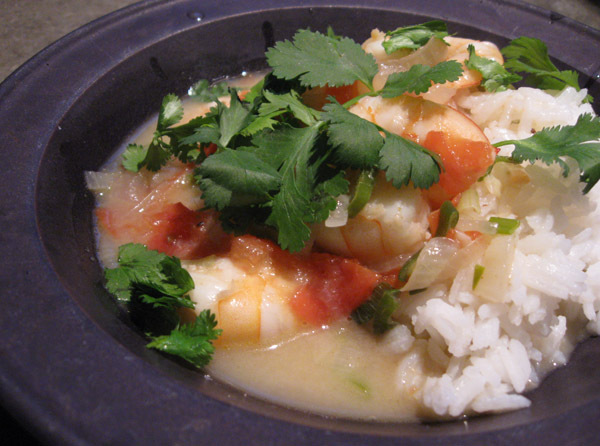 Add shrimp and cook just until opaque in center, stirring often, about 3 to 5 minutes depending on size of shrimp. Add salt to taste. Transfer curry to large shallow bowl. Garnish with cilantro. Serve, passing lime wedges separately.